​A one-pot synthesis of epoxides from commercially available benzyl alcohols and aldehydes is described. The reaction proceeds through in situ generation of sulfonium salts from benzyl alcohols and their subsequent deprotonation for use in Corey-Chaykovsky epoxidation of aldehydes. The generality of the method is exemplified by the synthesis of 34 epoxides that were made from an array of electronically and sterically varied alcohols and aldehydes. Tricyclic cores of the daphnane diterpene orthoesters (DDOs) are synthesized in ten steps from readily available materials. Key to their assembly is the development of a stereocontrolled p-quinol functionalization sequence which enables rapid access to DDO C-ring stereopolyads from simple precursors. Problems encountered in stereo- and regioselectivity are highlighted and solved by exact changes in choreography although it is shown the undesired stereochemical outcomes also proceed with high selectivity. 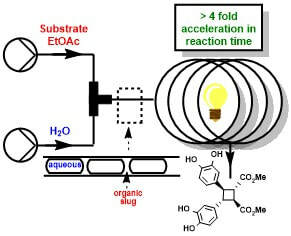 [2+2] photocycloaddition of cinnamates using a previously described cone reactor and a bis-thiourea catalyst is greatly accelerated by employing liquid-liquid slug flow. In most cases, a 4-fold acceleration in reaction time was observed with equivalent or superior yields. This approach has enabled significant improvement in the reaction throughput and expansion of the substrate scope to include challenging substrates. It has also enabled, to our knowledge, the first reported direct photodimerization in solution of electron rich cinnamamide substrates. There are great opportunities for innovation in the drug discovery process, particularly in the lead development phase. 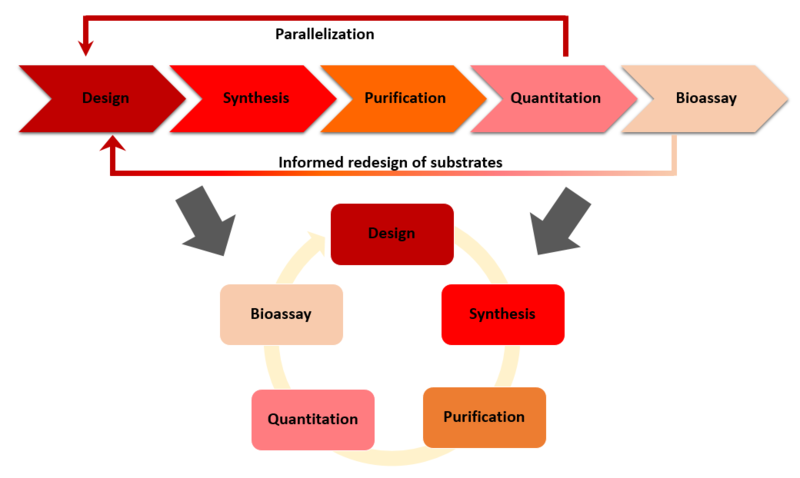 The traditional “design–synthesize–screen” cycle has seen little innovation as a whole despite major advances at each stage, including automated purification and synthesis as well as high throughput biological screening. It could be argued that the hit-to-lead and lead optimization processes remain slow and modular with inefficient flow of information, resulting in a loss of time and money. New flow technologies may provide a promising foundation for developing a continuous integrated small molecule optimization platform that would greatly enhance hit-to-lead and lead optimization programs. Herein, we discuss major developments in integrating synthesis, purification, screening, and machine learning into a single continuous-flow platform and provide some insight into future directions of this field. The first example of a regioselective and enantioselective intermolecular Buchner ring expansion is reported using continuous flow. The practicality and scope of the reaction are greatly improved under flow conditions. Reactions of ethyl diazoacetate with symmetric and nonsymmetric arenes afford cycloheptatrienes in good yield and excellent regioselectivity. The first example of an asymmetric intermolecular Buchner reaction is demonstrated with disubstituted diazo esters in good to excellent enantioselectivity. The asymmetric reactions proceed with absolute regioselectivity to afford cycloheptatrienes with an all-carbon quaternary center. ​Herein, we report the development of continuous flow photoreactors for large scale ESIPT-mediated [3+2]-photocycloaddition of 2-(p-methoxyphenyl)-3-hydroxyflavone and cinnamate- derived dipolarophiles. These reactors can be efficiently numbered up to increase throughput two orders of magnitude greater than the corresponding batch reactions. ​We report the exploration into photoredox generation of carbonyl ylides from benzylic epoxides using newly designed 4-mesityl-2,6-diphenylpyrylium tetrafluoroborate (MDPT) and 4-mesityl-2,6-di-p-tolylpyrylium tetrafluoroborate (MD(p-tolyl)PT) catalysts. These catalysts are excited at visible wavelengths, are highly robust, and exhibit some of the highest oxidation potentials reported. Their utility was demonstrated in the mild and efficient generation of carbonyl ylides from benzylic epoxides that otherwise could not be carried out by current common photoredox catalysts. Prion diseases are devastating neurodegenerative disorders with no known cure. One strategy for developing therapies for these diseases is to identify compounds that block conversion of the cellular form of the prion protein (PrPC) into the infectious isoform (PrPSc). Most previous efforts to discover such molecules by high-throughput screening methods have utilized, as a read-out, a single kind of cellular assay system: neuroblastoma cells that are persistently infected with scrapie prions. Here, we describe the use of an alternative cellular assay based on suppressing the spontaneous cytotoxicity of a mutant form of PrP (Δ105–125). Using this assay, we screened 75,000 compounds, and identified a group of phenethyl piperidines (exemplified by LD7), which reduces the accumulation of PrPSc in infected neuroblastoma cells by >90% at low micromolar doses, and inhibits PrPSc-induced synaptotoxicity in hippocampal neurons. By analyzing the structure-activity relationships of 35 chemical derivatives, we defined the pharmacophore of LD7, and identified a more potent derivative. Active compounds do not alter total or cell-surface levels of PrPC, and do not bind to recombinant PrP in surface plasmon resonance experiments, although at high concentrations they inhibit PrPSc-seeded conversion of recombinant PrP to a misfolded state in an in vitro reaction (RT-QuIC). This class of small molecules may provide valuable therapeutic leads, as well as chemical biological tools to identify cellular pathways underlying PrPSc metabolism and PrPC function. A novel, isoform-selective inhibitor of histone deacetylase 8 (HDAC8) has been discovered by the repurposing of a diverse compound collection. Medicinal chemistry optimization led to the identification of a highly potent (0.8 nM) and selective inhibitor of HDAC8. 31. "Photochemistry in Flow" Beeler, A. B.; Corning, S. in Photochemistry: Volume 43; Royal Society of Chemistry: Cambridge, 2016. Cyclobutanes derived from the dimerization of cinnamic acids are the core scaffolds of many molecules with potentially interesting biological activities. By utilizing a powerful flow photochemistry platform developed in our laboratory, we have evaluated the effects of flow on the dimerization of a range of cinnamate substrates. During the course of the study we also identified a bis(thiourea) catalyst that facilitates better reactivity and moderate diastereoselectivity in the reaction. Overall, we show that carrying out the reaction in flow in the presence of the catalyst affords consistent formation of predictable cyclobutane diastereomers. 9-Hydroxymethylxanthene derivatives were optimized as a photolabile protecting group for amines in flow chemistry. 9-Methylxanthene and 2-methoxy-9-methylxanthene showed excellent deprotection yields in protic and aprotic solvents, respectively. The protecting group has good stability in acidic, basic, and thermal conditions and was successfully utilized for protection and deprotection of a variety of amines. A multistep continuous-flow synthesis of a piperazinylcarbonyl-piperidine derivative utilized the 2-methoxy-9-methylxanthene as the key protecting group utilized in an orthogonal manner. Highlighted in Derek Lowe’s blog ‘In the Pipeline’ [link]. We have developed an automated photochemical microfluidics platform that integrates a 1 kW high-pressure Hg vapor lamp and allows for analytical pulse flow or preparative continuous flow reactions. Herein, we will discuss the use of this platform toward the discovery of new chemotypes through multidimensional reaction screening. We will highlight the ability to discretely control wavelengths with optical filters, allowing for control of reaction outcomes.